Florida, the 3rd biggest US state by population, usually places among the top in various state ranking lists. But until recently this wasn’t the case with solar energy. Between 2011 and 2016, Florida wasn’t even in the top 10 states by solar capacity. Things are now changing—fast. Residents can see solar panels popping up across their neighborhoods. In 2017, Florida actually added the third-most solar capacity of all states. The Sunshine State has finally arrived at the solar energy party. What changed? Well, one key factor was the proposal of controversial anti-solar energy law in late 2016. In the process of debating — and defeating — the law, state residents became better informed about solar power in Florida. What they learned is that solar energy is now a much better deal than before. Technological advances and economies of scale have led to solar panels dropping and their efficiency improving. And then there are supportive policies: the state offers some pretty solid solar incentives and rebates for those who go solar. Floridians have realized that as things stand today, homeowners can save lots of money by going solar. Want to know exactly how much you can save from solar panels in Florida? Enter your zip code to receive a detailed forecast from our solar calculator. And without further ado, here are all the solar incentives and rebates that homeowners can get in the state of Florida. 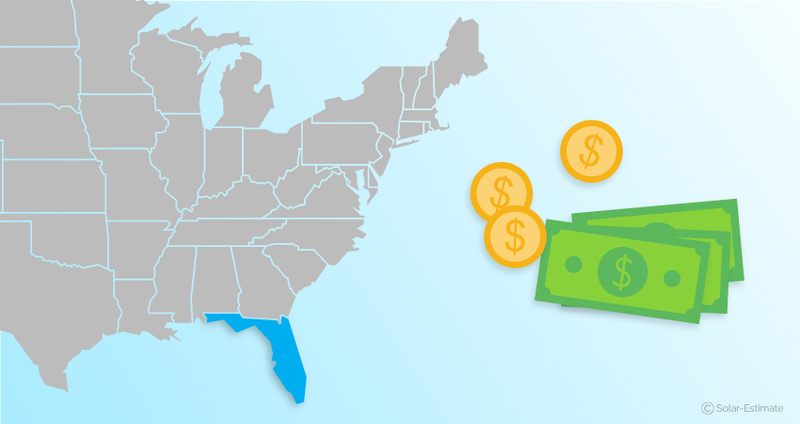 All investor-owned electric utilities in Florida offer net metering and interconnection for residential renewable energy systems up to 2 MW. This means that if you live in Florida, you are probably covered. The majority in the state buy electricity from these utilities, and 2 MW is way more than you would ever need. This is great news; net metering is the gold standard of solar incentives. Net metering means that any surplus energy can actually be sold back to the grid at full retail value. This provides many benefits. First off, you earn credits from selling electricity, which substantially reduces your monthly electricity bill. Secondly, you receive protection against rising electricity prices in the future—because if electricity prices increase, so does the value of your credits! Finally, you save money on upfront costs as you won’t need expensive solar batteries to store your excess power. [Learn more: What is net metering and how does it work?]. Florida’s net metering policies also stipulate that excess generation beyond your electricity usage can be rolled over. If you sell more power to the grid than you consume, the excess generation will not go to waste. Instead, the leftover generation from offsetting the current month’s bill can be used to offset future bills. This is super convenient. There may be months when you produce lots of excess power: in the summertime, or while you’re away on vacation. You can just roll over the credits to later months when your electricity usage is higher. At the end of the year, any remaining excess generation will be credited at the ‘avoided cost of energy’ rate. It’s worth noting, though, that the avoided cost rate is lower than the retail rate per kilowatt-hour (kWh). It makes sense to apply the credits when you can, as opposed to saving them for a cash-out later. *Duke Energy offers net metering not just in Florida, but across its service territory. This means that Duke Energy customers in Indiana, Kentucky, North Carolina, Ohio and South Carolina can also benefit from this incentive. One of the reasons homeowners consider getting photovoltaic (PV) panels installed is because solar now adds value to real estate. Of course, this benefit would be partially canceled out if the panels increased your future property taxes. Luckily, Florida has a solar property tax exemption policy. For residential systems, the exemption is a full 100%. This means your solar panels won’t add a cent to your tax bill. This benefit is not just for the solar market. It applies to a range of renewable energy systems. Eligible property additions include wind energy systems, geothermal heat mass and even biomass systems. Of course, solar photovoltaic (PV) systems are the most commonly claimed exemption in this category. Florida is one of just 3 states with residential PACE loan programs. PACE stands for Property Assessed Clean Energy (PACE). It is a government-backed program offering loans for property improvements related to energy efficiency and climate resilience. The PACE program helps make projects like the installation of solar panels possible for people without savings or poor creditworthiness. It offers 100% financing, meaning that no money down is required. You can receive the loan even with a low credit rating, as long as you are current on mortgage payments. Besides that, the loan is incorporated into the property assessment with local authorities. This means that the loan liability can stay with the house rather than the consumer. This a great option for people who want solar energy but aren’t sure how long they will live in the same house. Check out how PACE compares to other solar loan options here. This incentive has actually been around for a while; it has been offered in Florida since 1997. The exemption applies to many different solar systems, including photovoltaic systems, solar space heaters, solar hot water and solar pool heating. The exemption saves you from a 6% addition to the upfront cost of solar panels. The cost of the average solar system needed in Florida is $20,000 - which works out to a $1000 expense being avoided thanks to this incentive. Learn more about how much solar panels cost in Florida based on system size (in kilowatt hours) and which county you live in. Finally, there’s the Residential Renewable Energy Tax Credit - commonly known as the federal solar tax credit. This isn’t a Florida-specific incentive; it’s available in all 50 states. But this is the most important one to be aware of for anyone thinking of going solar in 2019. Why? Because it is such a huge benefit! It grants a full 30% tax credit on all costs associated with installing solar panels on your home. This means that if you buy a solar panel system worth $20,000, you will get a cool $6000 back as a tax credit. This effectively reduces the price of a solar system down to just $14,000. There’s another reason to keep your eye on this incentive. The 30% credit is currently scheduled to end on December 31, 2019. It seems unlikely that the 30% solar credit will be extended beyond this. By opting to get solar panels now in 2019 you are guaranteed to benefit from it.